As the innovation race hots up, how can we value intangible assets? Realizing returns from investments in innovation. The global innovation race is heating up, with advances in artificial intelligence, blockchain, biotechnology, data storage and other cutting-edge technologies transforming sectors and global markets. To compete, companies can innovate in-house, or they can acquire others’ innovations. Spending on R&D is one metric by which investments in innovation are measured. Earlier this year, the European Commission published a study surveying 2,500 companies across the world that invested a combined €24 million in R&D in the 2016 fiscal year. Among them were 481 Chinese companies, including 105 Taiwanese companies. According to the report, 10 of them have now entered the top 100 global R&D spenders. However, investors are getting increasingly concerned about realizing returns from investments in innovation. Active strategies that focus on analysing a company’s financial statements and revenues are now returning substantially less on average than in the 80s and 90s. This has to do with the difficulty that investors have in predicting the financial returns of digitizing business - the core assets of today’s leading businesses are very different from the modern industrial era. 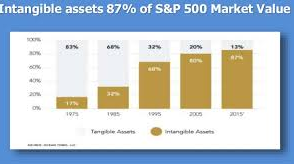 As noted by MSCI, over 80% of the enterprise value of the S&P 500 today is in intangible assets such as patents and trademarks, as well as software, brands and IT acquisitions. Intangible assets have very different dynamics and risk profiles than tangible assets, so valuing companies that make them is challenging. In their bestselling book, Capitalism without Capital, Professor Jonathan Haskel and Stian Westlake detail intangible assets’ distinct characteristics, including the spillover effects of these assets. For instance, they describe how the biggest strength of Uber’s business model lies in its network of drivers, but that it’s not uncommon to meet an Uber driver who also picks up rides for Lyft. They also describe the scalable nature of these assets and how, after the initial expense of the first unit, products can be replicated ad infinitum for next to nothing. Putting your finger on the asset or having reliable metrics on the value of an intangible asset is a real challenge for investors. For example, R&D efforts only show up in accounting as an expense. This in turn bears negatively on revenue forecasts, which can both obscure visibility on where innovation is happening and discourage publicly listed companies from investing in R&D. Other intangible assets like patents or brand value may not even be recognised anywhere on financial statements. Finally, the nature of intangible assets is that they often have low marginal cost and can be very easily scaled to advantage a business. A true innovation often goes unrecognized in its early stages by the market. Whether it is in the field of biotechnology, cloud computing or artificial intelligence, to take a few of today’s innovation platforms, innovations often have long and flat adoption curves, as network effects and lack of understanding delays their embrace. A successful company like Amazon took a decade to become profitable, as e-commerce was only just beginning to take off. Yet, most truly innovative products and business models have recently ended up as platforms, and “winner takes most” markets. (Source: ARK Invest). This is the reason why it is of interest to catch innovations early. There are also differences between innovators. One differentiating factor is how capable a company is in commercializing its innovations, and another is whether a company is reinvesting in future opportunities, including in ways to retain and protect its competitive advantage. A company may be protecting its competitive advantage by pursuing an innovation strategy based on acquisitions or based on endogenous development of assets – and it is important to develop better metrics to assess which leads to more value creation. In the European Commission’s report, Huawei ranked highest of Chinese companies. Its annual R&D investment in 2016 was €10.3 billion, ranking sixth in the world and far ahead of other companies in China on this metric. Yet, we may also be interested in evaluating a company’s long-term commitment to innovation: how much the top Chinese R&D “euro spender” companies invest back in their business in R&D as a % of their revenue (net sales). Applying this metric, the list looks different. Only the following Chinese and Taiwanese companies each spent over 20% of their net sales in R&D in 2016: Mediatek, Ctrip, Kingsoft, Sina, and Perfect World. To go one step further, focusing on the ‘d’ in R&D – development, we can look at how swiftly companies were able to commercialize their R&D investments. To measure this, we would need more than the current year’s gross profit/last year’s R&D expense, since many factors impact the desirable time frame to commercialize R&D, including other intangible assets of a business such as its talent and branding capacity. The above only touches the surface of understanding the worth of R&D activities. To truly understand the value to be realized from R&D activities, a much more granular detail on the type of research undertaken would be helpful. For instance, within pharmaceutical research, this would involve knowing the type of basic research undertaken and the number of clinical trials on a given drug. Over the past 40 years, the rate of investment in real assets such as property and factory plants has fallen by 35%, whereas the rate of investment in intangibles has grown by almost 60%. In the recent years of low interest rates, there was much talk about companies investing back in their business in financial assets (debt buy-backs), and academic commentary about why this kind of asset-light strategy can lead to under-investment, an excessive reliance on outsourcing and the artificial division of companies to avoid hard assets. Instead, the real challenge is to change the way we recognize not only the R&D, but also the strategic asset investments companies make, as well as appreciate the development activities related to appropriately measuring the time horizons of commercialization of innovations that make a difference to our economies. To measure the value created in the innovation process, Lev suggests tracking managers’ strategies for transforming investments into strategic resources. Whether that be preserving and protecting these resources from infringement and decay and deploying them individually by licencing patents (or more commonly in combinations) in production and marketing. These actions are all aimed at creating value that enables companies to compete and maintain the supply of investment funds. What is the 'intangible' economy and how could taxing it bring new rewards? Tracking development activities also includes the time-sensitive activity of preserving strategic assets such as a brand, as things such as brand decay can present a hiccup to funding further innovation. As the era of the Fourth Industrial Revolution is defined by a race for ground-breaking innovation, talent and software and, ultimately, sustaining customer appetite for those innovations, we need smarter tools to recognize where innovation is taking place and how it is being commercialised. This will be of importance to corporates and investors, as well as to central bankers as they look to understand the state of the economy, and for the public sector as they partner up for PPPs in value creation for the economy of tomorrow.